This month we’ve the pleasure to introduce Urban Playground, who worked with us as part of Made in Foxhill, grab a cuppa and be inspired! We’re the original performance-parkour (2PK) company. We bring together dance, theatre and parkour in shows that play on the street and in theatres all over the world. We work with professional dancers and with community participants who come from all sorts of backgrounds. The youngest person we’ve worked with was 3, the oldest 95. We work with people of all abilities and we work with them where they live – from the snowy streets of Scandinavia to the scorching hot plains in Southern India. What project/s are you currently working on with Creativity Works? 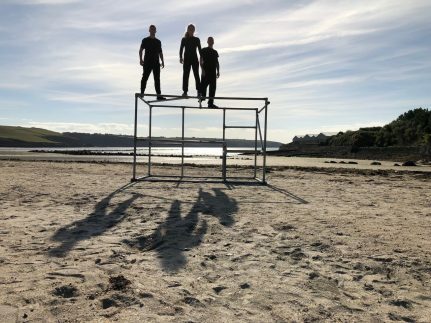 We were part of the Made In Foxhill project, going in to schools and working at various community events, introducing people to performance parkour and encouraging them to move. So many people! We work with music a lot and at the moment we’re enjoying the new wave of hiphop artists like Loyal Carner and Lil Simz, and people like Bishop Nehru and Moses Sumney who are shifting between genres. What book or exhibition has inspired you recently? There was a great exhibition at the Tate Modern recently called ‘Degenerate Art’ which showcased Weimar Republic graphic artists, a brilliant reference for making characters. We also love the work there by Guerrilla Girls. They deserve a much larger exhibition! We follow the Stop Telling Women To Smile project online, having encountered Tatyana Fazlalizadeh’s work and having heard her talk when working in Baltimore a few years ago. Its a brilliant example of how an artist can work with participants to effect a visible change in the community. What’s been your biggest professional, personal or creative achievement to date? Our company turns 20 next year. Its a huge achievement. Its difficult to have an ensemble in this country but our core team have all been working together for over a decade now and there’s something very special about that. Also, being able to say we’ve toured across five continents will always be a big deal for us. What are your creative aspirations? We’ve recently moved to Cornwall where we’re in the process of developing a permanent home. If we can raise the funding we’ll have, within a couple of years, our own rehearsal space and the ability to welcome companies to come and make work here, and share their skills with young people growing up in the area. What advice would you give an emerging socially engaged artist? There’s no set path or route that works. You have to be true to your own values, work from them, and be prepared to carve out your own path. Don’t compromise. Do work with the same people for years. Choose partner organisations that are in it for the long-haul. Work with and support other artists and organisations. Promote diversity.